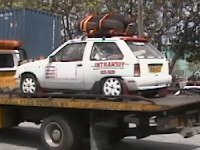 With 5 days to go until the team travels to Barbados for the 2003 Rally Carnival, final preparations are now being made for the trip. The car has arrived safely in Barbados following its 10 day voyage from Portsmouth to Bridgetown on the Santa Catherina Geest Line ship and has now been transported to secure storage at Simpson Motors – the islands GM/Opel dealership. Meanwhile various spares and other items are currently being assembled to be taken to the island. 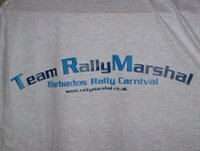 The team members should be easy to spot on the island with distinctive Team RallyMarshal clothing, designed especially for the trip now in the teams possession including Polo shirts, T shirts and baseball caps for all the team members. The team will be running various competitions to win some of this exclusive clothing during the event so keep up-to date with the website to be in with a chance. The first weekend of rallying fun will be at the Sunbeach International Rallysprint at the Vaucluse Raceway. This will prove to be an interesting and exciting battle with Paul and Sean sitting together in a rally car for the first time – at least on the Saturday practise runs. With a new engine fitted and Paul not rallying on the rallysprint circuit previously, the plans are for a steady time will be had to make sure the car and team are ready for the Rally Barbados the following week.